Home » Posts Tagged "Shopso.com"
Google Glasses, according to the June 28-29 Weekend issue of The Wall Street Journal Off Duty Page One article, are going to make an impact during the tourist season. They are available now (“on and off”) through Google, Diane Von Furstenberg, Net-A-Porter, at a cost of some $1,500 but the official launch is expected only in several months. Expect them to drop in price as they become more readily available and perhaps even give the smart phone some competition, one day. After all, you can take a photo with this heady smart phone, get directions, find a restaurant, look totally cool to those who know, and not look like a tourist to those who do not. 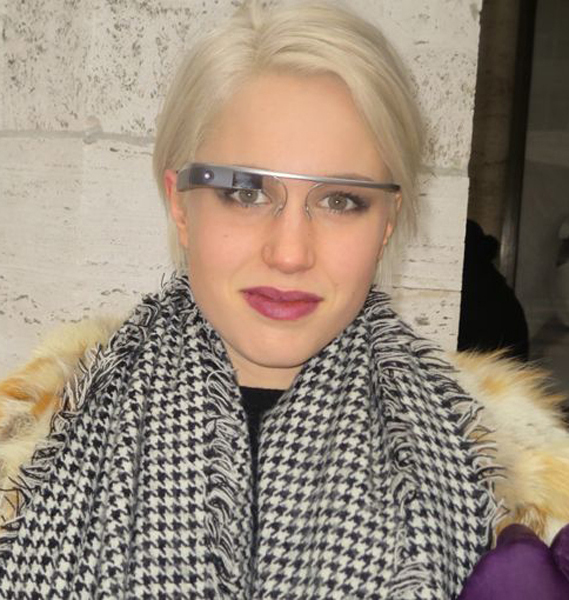 Google Glasses worn here by Victoria Gamien, Director of Marketing, Shopsy.com, photographed for my Seen on Scene Blog, Day 4, at the Lincoln Center during the Mercedes-Benz New York Fashion Week for Fall 2014.